Dubliners U2 started in their hometown in 1976. They began their legacy rooting their music in the political turmoil that was all around them. After having Steve Lillywhite produce their first three albums, U2 looked for a more sophisticated and experimental sound. They hired Daniel Lanois and Brian Eno to produce "The Unforgettable Fire" and "The Joshua Tree" albums, which both put them onto the charts all over the world. After the 80s ended U2 re-invented themselves once again. Incorporating elements of electronics into their rock construct, U2 created a new sound with "Achtung Baby". Bono and the band used their notoriety more than ever expressing their opinions on social matters on a global scale. Inducted into Rock And Roll Hall of Fame in 2005 (Performer). Due to their uncanny ability to change with the times, U2 have managed to stay alive as the majority of their '80s counterparts have disappeared. The evolution of their music is ongoing, and each new record seems to bring a never-before encountered style to the band's oeuvre. From the jangly Post-Punk of their earliest records to the genre-exploding extravaganza that marked their hyper-rhythmic re-entry into the post-Nirvana world, the quartet has provided an utterly original sound and a rarely matched depth of feeling every time. Clearly inspired by post punk legends joy division (in fact Bono is has often cited Ian Curtis as his biggest influence) alongside Kurt Cobain. 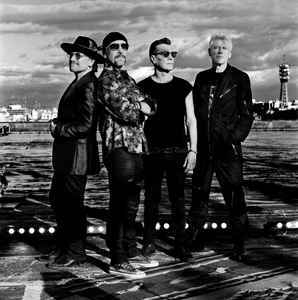 The band continues to produce emotionally stunning music, injecting everything from countrified pedal steel, gurgling Techno sounds and processed hip-hop beats into their particular brand of Euro-rock.In 2000, U2 showed a spectacular return to form with the release of All That You Can't Leave Behind. Singles such as "It's a Beautiful Day," "Stuck In A Moment...," "Walk On" and "Elevation" helped redefine the band's sound once again, with All That You Can't Leave Behind going platinum three times over. Original players in the post-rock sound, U2 came full circle in 2004, when they released How To Dismantle An Atomic Bomb. Ironically, the album was released in the midst of a trendy resurgence of post-punk, cementing U2's place as pioneers of the sound. Fittingly, U2 was inducted into the Rock and Roll Hall of Fame in 2005, i just wish now that Bono would stop trying to be like Sting and Bob Geldof!! Joshua Tree ...with Brian Eno's wavy strings and Lanois pushing them.. top 3 lp all time for me. absolutely the best.i grew up with em.since i first saw October live from Under a blood red sky.it left me dumb. cheaper concert tickets and it would be better for everyone. Totally agree with matt03wfu. Proper place for these kind of releases is in Miscellaneous section. We really really really need to find a way to clean up the categorization for releases --- I can't be the only one that cringes when I look at the "Albums" view and see random interview discs and promo live releases along side the main studio albums. I don't disagree with all the U2 detractors when they complain about the band's persona, their marketing tactics, or their crusading, self aggrandizing theatrics. However, it has become quite popular to bash them and yet they remain incredibly vital and ambitious as artists and songwriters. "Songs of Innocence", for all of the wailing and gnashing of teeth over the forced download, is actually another great effort. That's nothing to say of the magnificent and relatively ignored "No Line On The Horizon". If you ever enjoyed U2, ignore the naysayers and get back to listening to the music. The last 20 years have been glorious. The best band in the world! All of time! When MTV first came out in the early 80's, Gloria video was played constantly. I bought October and thought it was pretty good. My friend in school was the president of a club at his church in Grand Rapids, MI and said U2 was going to play there. He asked if I wanted tickets. They were $7 each and I thought it would be pretty cool to see another rock band play in a church. I had seen the Romantics there the year before. I took my girlfriend and we were incredibly impressed. There were maybe 4-500 people in all.15 years later, I saw them at Mile High in Denver to a crowd of 20,000. Wow how times had changed a band!